Wanting your child to have a bright healthy smile starts with having your child develop the habit of brushing their teeth regularly. The best way to have your child learn about the importance of brushing their teeth is to see you brush your teeth regularly. When a child sees you brush regularly they learn by your example that the habit of regular tooth brushing is an important one to have. It's a matter of introducing good oral care when the child is an infant. Yes, that young. 25% of children will have cavities by the age of 4, some children as early as age 2. (source: Columbia University School of Dentistry. ) When you clean their gums and those early baby teeth, you are showing your child from toddler age the importance of dental care. As your child is able to do more, he or she will enjoy mimicking you as you brush. Letting your child follow along lets your child feel like a 'big kid'. By starting at a young age, your child will have begun their lifetime habit of brushing their teeth. When you start helping a toddler brush their teeth, understand you will be doing the majority of the work. Making the process a game by using fun toothbrushes that play music or light up can be a help in encouraging your toddler to brush. Guide your child in the proper technique as you brush. Start by sitting in the lotus yoga position with your child's head in your lap. Starting your toddler on tooth brushing is a building process. You will increase the effectiveness over time. Initially you may meet with some resistance from your toddler, but aim for a minimum of once a day. If they fight you, go through the motions and you may not be able to do a good job initially, but with the daily routine, in time they will give in and you will be able to do a good job of brushing their teeth. Give them the opportunity to do it on their own at the second brushing of the day. Supervise and make suggestions on how they can do a better job on their own. Don't use an adult toothbrush. Get a small one so your child won't gag as they brush. And just a smear of toothpaste is all your toddler will need to get started. Teach your child to spit out the toothpaste, not swallow it. Different toothpaste flavors appeal to different children, so try a couple of flavors to see which one they like. When your child is 6 they will be better able to do brushing their teeth on their own. That doesn't let you eliminate the supervision though. By using a disclosing rinse or tablet you can make a game out of your child seeing where they missed in their brushing. It's common for children to forget the tongue and cheek sides of their teeth. A hand mirror and disclosing tablets can make fun of a teachable moment. Around 24 months is a good time for the first visit to the dental office, or sooner if you notice a problem. 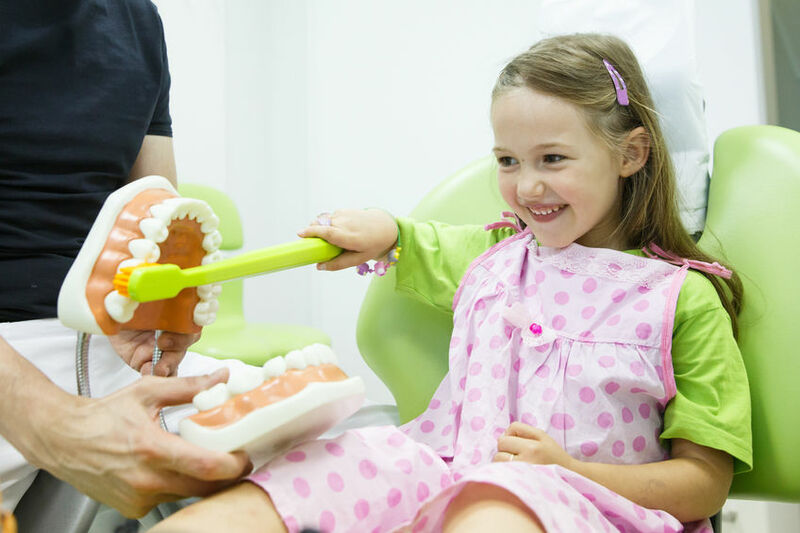 At Colonies North Dental Care in San Antonio TX, we encourage a parent bring the child in for the parent's teeth cleaning. We've found this is an easy introduction to the office and also some toddlers are ready to have their teeth cleaned as well. When a child naps or goes to sleep with a bottle containing formula, or sugary drinks the child may end up with Baby Bottle Syndrome. This occurs when the drink other than water rests against the teeth for long periods of time. The teeth decay and can lead to cavities. By weaning your child off of sugary drinks gradually by diluting the juice with water until the nap or bedtime bottle is just water is one way of minimizing your child's chance of baby bottle syndrome. Having your children brushing their teeth is the beginning of their having a great smile for life. As a caring Mom or Dad, you want to protect your child's smile the best way you can. By teaching your child to care for and brush their teeth at an early age, your child's smile can be bright and healthy for years to come.